There are several different approaches for throughput testing and followings are a couple of possible sectors (or profiles) I can think of for throughput testing. (It would be a little bit tricky to draw a line between profile (A) and (B) because it would be difficult to achieve very high data rate without meeting a certain degree of Real Time Requirement. So Very High Throughput would imply a certain degree of Real Time Requirement as well). If you think about the time when HSDPA came out first and then evolve to higher and higher categories and think about the time when LTE device came out first. Almost everyone's interest have been focused on "Can the device achieve the maximum throughput specified in 3GPP spec ?" On the other hand, some people say "Why we care about testing the max throughput ? In live air, there wouldn't be any condition that allows max throughput anyway. For example, if you have the LTE Cat 3 device, your max downlink throughput is around 100 Mbps. Would live network ever allocate this amount of resources for a single UE ? or can we have such good signal quality that can allows this kind of throughput ?". The answer would be "Probably Not". But this kind of testing would still be very meaningful not only for marketing reason but also for technical reason. 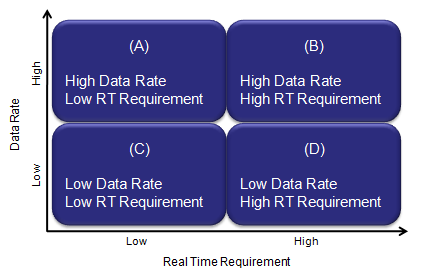 The condition required to achieve the max throughput would be one of the most stressful condition for almost all the components which is in the ways of data traffic. So achieving a max throughput can be a very good criteria of the whole device functioning under a very stressful (fully loaded) condition and also be a good validation criteria for chipset's encoding/decoding process, L2, L3 and various device drivers. Let's assume that my device has passed the the max data throughput test (profile : B), does it automatic indicator saying "It would pass all the low throughput profile, like profile (C) or (D) ?". Probably "Yes, for profile (D)", but "No, for profile (C)". Until recently (as of Apr 2013), most of low throughput application would belong to profile (D), like browsing, email etc. But as LTE come out and become more widespread, we foresee more real time application based on data traffic which would belong to profile (C), e.g, Voice over LTE, on-line Gaming etc. In this case, just passing the max throughput would not guarantee the pass in this area. The key requirement on this category would be "It should 'guarantee the required Bit Rate (GBR)' and it should be delivered 'On-Time' (Real Time)'. Even though we can think of a couple of check points for this feature, there are not much practically known about implementing/testing this feature yet. I will get this updated as I get more hands-on experience/information on this. (On radio side, a lot of effort should be invested on optimizing the low layer scheduling parameters, e.g, Semi-persistant scheduling, some RLC parameters and optimal resource allocation based on Buffer Status Report etc).